In this review, we will be taking a look at the CyberpowerPC Gamer Xtreme VR GXiVR8020A gaming computer. The aim of this review is to provide you with all the information, both technical and otherwise, that you need to make an informed decision on whether this computer is the right fit for your needs. To that end, we have structured this review in such a way as to highlight all the various features and specifications that make a great gaming rig. Firstly, we will take a look at the components that go into this computer, such as the motherboard, graphics card, RAM, but also passive components such as the power source and housing unit. Then we will discuss its capabilities in terms of performance, what you can expect to get from it in-game. We will conclude by offering a detailed list of pros and cons, which is designed for easier perusal. With all that in mind, let us get started. Let us take a look at what makes this gaming computer tick. Firstly, to get the boring stuff out of the way as soon as possible, we will take a look at the supporting infrastructure, before moving on to the main components which underpin a powerful gaming machine, such as the graphics card, processor, and so on. The power supply is the component that underpins the entire construction when it comes to gaming computers. This computer uses a High Power 600 Watt Power Supply, which is enough to power it when it comes to regular gaming use. However, trying to overclock either the graphics card or the processor is not advisable, as this power supply is unlikely to be able to handle it. The housing unit, or computer case used for this computer is the Cooler Master MasterBox 5 Black Mid-Tower Case, which can be reconfigured to fit any type of graphics card or processor, should you one day decide to upgrade. Furthermore, it has room for as many as three coolers on the front panel, and an additional one at the back. This computer comes with a built in LG 24x DVD CD RW DL M-Disc Optical Drive, which is not exactly a necessary feature anymore, but it certainly doesn’t hurt. It also comes with a keyboard and mouse set, under the CYBERPOWERPC brand name. These are solidly built gaming accessories, and you should have no problem getting accustomed to them as your inputs. Let us turn to the glue that holds everything together in any computer – the motherboard. This computer uses a MSI B150M Bazooka Motherboard, which is optimized to handle high-demand gaming. It features one HDMI port, 4 USB 3.1 ports, 2 USB 2.0 ports, a DVI and a LAN port. It supports up to 64 GBs of RAM, so you can upgrade your rig to the extreme.This motherboard also places emphasis on the sound quality you can get out of your computer, and has a very detailed list of features we would advise you to check out before purchasing this computer. Moving on to the storage department, this computer comes equipped with a 1 TB Toshiba DT01ACA100 3.5″ 7200 RPM Hard Drive. It features a 7200 RPM spindle speed, and 32 MBs of buffer space. By now, this has become the industry standard, though for more demanding users, this may be a bit too little space, so you might consider upgrading with an SDD, especially for storing game installations. In terms of RAM, this computer also meets the usual gaming benchmark, which is 8 GBs of RAM. This is subdivided into two ADATA XPG Z1 4 GB sticks, which is considered the optimal way of running RAM memory. As previously mentioned, if you find yourself in need of more RAM, you can upgrade up to 64 GBs in total on the motherboard inside this computer. Finally, let’s talk about the big guns. Firstly, let’s take a look at the CPU. This computer relies on a 6th Gen Intel Core i5-6402P 2.8GHz Quad-Core processor, which is a fantastic choice for a gaming rig. It is often the case that the processor throttles the overall FPS of any given game, since it does not keep in step with the graphics card, but in this case, that simply won’t be an issue, due to its speed, and the fact that it has four cores. The biggest star always enters last, and that is true of this review as well, since we’ve saved the graphics card in this computer for the end of this section. Namely, this gaming rig uses an AMD Radeon RX 480 4GB Video Card. Arguably the most important feature this card has to offer is the fact that it has 4 GBs of video memory. This is important if you want to enable some more advanced features in the Video Settings menu of your favorite game. Some features, such as V-sync and Anisotropic filtering, require more memory in order to work, and this card provides that in spades. Now let us take a brief look at what you should expect from this computer in terms of its performance in actual video games. It is very important before you buy a pre-constructed computer to know what it can actually do in a measurable and reproducible way. That means that you will know exactly what you are buying, and what it will be able to do once it arrives. With that in mind, let us take a look at some metrics by which we can measure this computer’s capabilities. For the purposes of this short review, we will be using the general test, which has become something of an industry standard when it comes to grading a computer’s abilities, and that is the 3DMark Time Spy DX12 benchmark test. This computer generally scored well on this test, with an overall mark of 3704. This can further be subdivided into the graphics test, and the CPU test. It fared a bit better on the graphics test, coming in at 3814, whereas the CPU test yielded 3187 points. Thus, we see that though the CPU lags behind the GPU slightly in terms of overall performance, it doesn’t weigh it down to any significant degree, which shows that the designers of this computer took care to select components that play well together, which is what you want in a good computer. Let us take a look at some of the most important positive aspects to this computer, in a way that is easy to skim, and that will help you make the final decision as to whether this computer is the right fit for you. Complementary components: This computer was put together by a team of experts in order to get the most bang out of every component that goes into it. That is why only those components which have been proven to work well together were selected to go into this computer, providing an added bit of reliability and just that much more efficiency. Great value: Most users who bought this computer and were satisfied with it noted that it cost less than it would have cost them to buy all the components individually and assemble themselves. The opposite was the case just a few years ago, and smart shoppers should take advantage of this situation. Optimized for gaming: This computer was made specifically with gaming in mind, and all the components are certified by various authorities and game developers as being fully compatible and efficient with all of the latest titles. Indeed, the manufacturer points out that it can run all the latest games at maximum settings without any problems. VR Ready: In addition to being optimized to handle any traditional game at the highest settings, this computer was also tested and certified to run an Oculus Rift, which is a big advantage if you think that virtual headsets are the future of gaming, and you want to get in on the ground floor. It would be disingenuous of us to claim that this computer is perfect. Our goal is to provide you with all the information you need to make an informed decision on whether this computer is right for you, so we have decided to include a list of the negative aspects of this computer as well. Let’s take a look. Power supply: This computer comes with a 600W power supply, which may be more than enough to power most computers, but its performance here is lacklustre at best. It precludes the user from overclocking either the GPU or the CPU, let alone bot at the same time. Though the power supply is great quality, its capacity is simply barely enough for the sort of thing users may wish to do with it. RAM on the low end: For any gaming computer, it is very important to have an ample amount of RAM. This number is always shifting, but currently 8 GBs is considered standard. However, in an advanced computer like this, users have argued that this is not enough, and that more RAM would enable the computer to perform better. 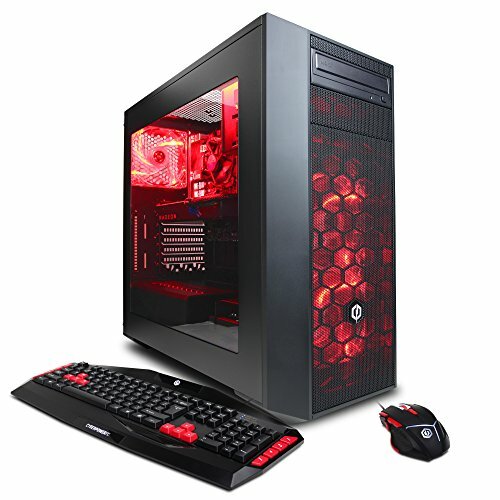 Warranty: 1 Year Parts & Labor Warranty Free Lifetime Tech Support"
We hope that this review of the CYBERPOWERPC Gamer Xtreme VR GXiVR8020A gaming computer has help get you up to speed on all the various features and abilities this computer has to offer. We have tried to give a relatively detailed and unbiased review, in order to equip you with all the information you need to make the decision on whether this rig is right for you. Power supply limitation aside, this is one of the more valuable pre-built computers we’ve reviewed. It is priced in the mid-range and comes with plenty of power to get you gaming. Pair it with easy upgrades and you have yourself a great base for PC gaming.